Beni-Israel; born about 1820 in Bombay. 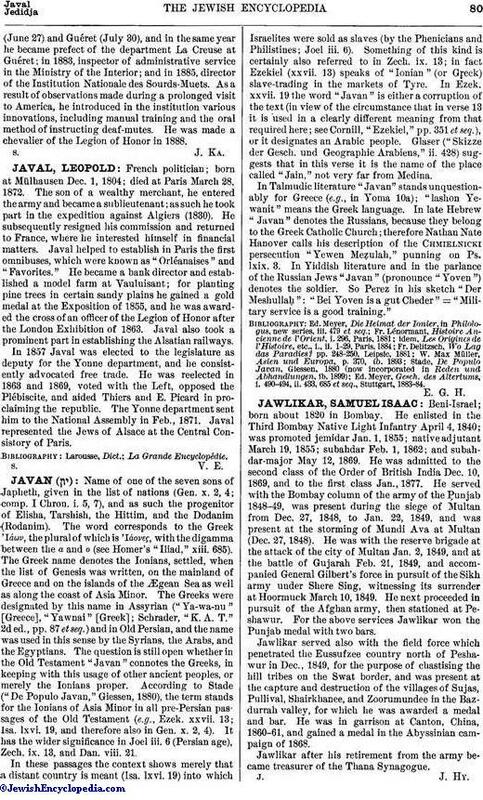 He enlisted in the Third Bombay Native Light Infantry April 4, 1840; was promoted jemidar Jan. 1, 1855; native adjutant March 19, 1855; subahdar Feb. 1, 1862; and subahdar-major May 12, 1869. He was admitted to the second class of the Order of British India Dec. 10, 1869, and to the first class Jan., 1877. He served with the Bombay column of the army of the Punjab 1848-49, was present during the siege of Multan from Dec. 27, 1848, to Jan. 22, 1849, and was present at the storming of Mundi Ava at Multan (Dec. 27, 1848). He was with the reserve brigade at the attack of the city of Multan Jan. 2, 1849, and at the battle of Gujarah Feb. 21, 1849, and accompanied General Gilbert's force in pursuit of the Sikh army under Shere Sing, witnessing its surrender at Hoormuck March 10, 1849. He next proceeded in pursuit of the Afghan army, then stationed at Peshawur. For the above services Jawlikar won the Punjab medal with two bars. Jawlikar served also with the field force which penetrated the Eussufzee country north of Peshawur in Dec., 1849, for the purpose of chastising the hill tribes on the Swat border, and was present at the capture and destruction of the villages of Sujas, Pullival, Shairkhanee, and Zoorumundee in the Bazdurrah valley, for which he was awarded a medal and bar. He was in garrison at Canton, China, 1860-61, and gained a medal in the Abyssinian campaign of 1868. Jawlikar after his retirement from the army became treasurer of the Thana Synagogue.